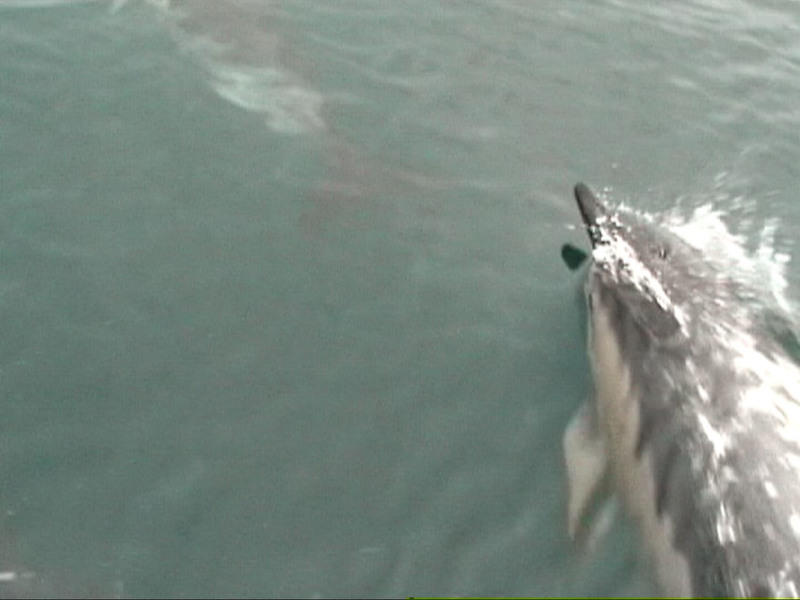 If you enjoy looking at these sleek creatures here's our own little video from which this shot was captured. A purple Mohican haircut climbed over the stern followed by a broad grin on a painted face and a young muscular body written all over in body paint with a truncheon bulge in the front of tight, pink swimming trunks. On the cliffs behind a chorus of hoots and whistles from a crowd of tipsy blokes and us half-rising from our seats near the wine bottle and what the hell is going on please and why didn't we buy the pepper spray? But a grin like his couldn't be malevolent and, while he sat a little unsteadily on our cockpit coaming, we couldn't help but grin back. Among cheers and jeers from his mates on the shore he told us he was getting married and had to get drunk and do some dares and he was well on with the first and we were one of the dares. We talked in bits of English and bits of French and he was drunkenly in love with his baby and Ann got the wrong end of the stick and asked him whether his baby was a girl or boy and that confused everyone for a moment or two. His mission was to get a kiss from the Welshwoman and to get the Welshman to drink from his bottle of Pastis. I could see Ann struggle with the idea of kissing this water nymph with the big grin for about a millisecond. Cheers rang out, loud enough to start an avalanche in the Alps. Then he produced from down the bulging front of his trunks a bottle of milky liquid for me to drink from. I'll drink pastis at any time and from any place, but from that particular place? Despite the coolness of the sea, the pastis was a little warm. Cheers and whistles and echoes from the cliffs, shouts and grins and waving hands. Ann, worried that this drunken bridegroom might not make it back to the beach, donated a swimming float to his growing collection of trophies. Finally we thought about a photo but as he posed, balanced on the edge of the transom, the boat moved and he fell off into the sea. 'What a nice young man,' said Ann primly waving to his mates on the cliff path, 'Maybe you should carry pastis around with you.' 'I don't have the room,' I said. 'Not with the beer keg and your wine carafe.' 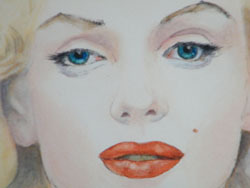 Later the swell decayed and we went to bed early, tired and tipsy, my seasick pill pulling my eyelids down. There's nothing like a good night's rest to perk you up. At 5:30 in the morning the fridge alarm went off. Port Napoleon, France; 1873 miles to Gouvia. Six weeks to launch. The boat hoist launched Aderyn Glas quietly into the water while a small crowd of friends watched and passed whispers around. Ann and I held our breath as the water lapped up her sides but she settled well enough. After a while I pressed the button to start the engine and an alarm started screaming. We looked at each other and began to worry. Hi and welcome to Seasolutions. 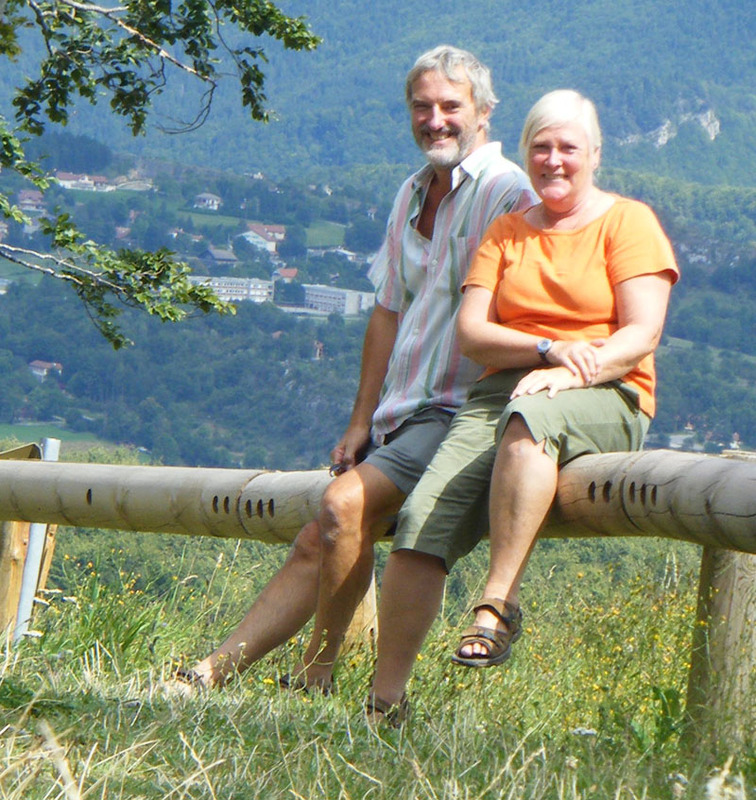 We're Ann and David Berry and we are, without doubt, part-time liveaboards. Every spring and autumn we take ourselves away from our home in South Wales and fly off to spend three or four months in the sunshine on our sailing yacht Aderyn Glas. And, yes, we wrote a book - what else could we do for fun? We think we've got the best of all worlds, cruising in the spring and autumn, enjoying the (hypothetical) British summer and staying warm and snug at home in lovely Wales as the winter blows through. We're obviously not hardy enough to be full-time liveaboards. We enjoy the spring and autumn aboard - they're lovely - full of sunshine and breezes and people who share our lifestyle and ethos but in the winter rains we want to live in a house with large rooms and warm heating so we can avoid cabin fever. We want to bring you something. We've clocked up a large number of hours and miles cruising in the Med and we want to try and help anyone who's living or contemplating the PTL life by publishing some of what we've discovered to be useful over the years we've owned a boat. 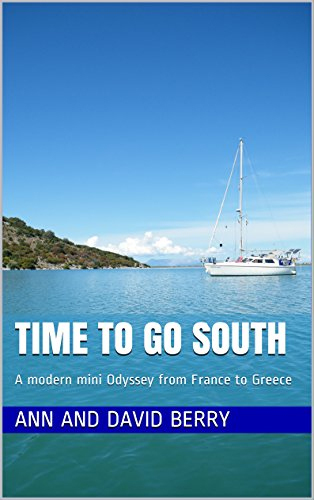 We've been doing this since we traveled through the French canals in 2008 meandering for six months from Cherbourg to Port Napoleon and then on to Greece the following year again taking six months to explore Corsica and the Italian islands. So we've clocked up the sea hours and we've been learning all the time, often inventing and discovering our own solutions to the many problems we faced, and sometimes taking on board other sailor's ideas to meld with our own (and to all of those guys a grateful thank you). Okay, you're saying, who are these people and why should I be interested? After all they've only managed to get from Plymouth to Greece. Well, we're not Francis Chichester and Ellen Macarthur but neither are most of you and the problems we face are not the ones either of those worthy people would even recognise (they probably don't even know what a Jabsco toilet is and buckets don't have choker valves). The other member of our family is our beautiful yacht Aderyn Glas, a 10m (33 foot) Moody Eclipse built in 1992. She keeps us dry and safe whatever the weather and in return we spend a lot of time and effort maintaining and improving her, which is what this site is about: we're constantly making, fixing, changing, replacing and each time we do we consider whether what we've found is interesting enough to add it here. Everything on this site is our own work. Everything you read are our personal opinions and may not accord with yours. Everything here has been worked out and tried on Aderyn Glas and is something we find useful. If you're contemplating doing what we've done you might find the tips and tricks that have made life on board even more acceptable to us of interest. Please get in touch with us if you have points to make or questions to ask. We've invented our own scale to represent the importance of each item to our liveaboard life in the Med. Five hearts means essential down to one heart which means nice to have. Please remember, this is our personal assessment of what is important to us, on our boat, in the Med. Our Aderyn Glas logo was designed by graphic designer James Potts who combined the timid Aderyn Glas (Blue Bird) with the fiercely protective Welsh draig. Please visit his website. David Berry spent thirty years as a systems engineer in the defence industry working latterly on hardware and software integration projects, such as simulators. He has degrees in Mechanical Engineering and Computer Science. Forty years of working was long enough to convince him that he wasn't really cut out for it so when an opportunity arose to escape he didn't hesitate and retired at the ripe old age of 55. So then came a PPL to go with his GPL and Aderyn Glas. Ann Berry holds an honours degree in Zoology from London and a PGCE from Manchester. She spent thirty years in education, finally retiring from her post as Director of a Further Education college in 2007. She is a past member of MENSA. The week after Ann retired the two of them began an odyssey that took them to the antipodes before a three year period living and travelling abroad, sometimes on Aderyn Glas and sometimes ashore most notably near Cartegena, Spain. Ann and David own a Moody Eclipse 33 Aderyn Glas which they think is the most practical and beautiful boat in the world and would be heaven if she would only stop listing to port. During the summer of 2008 they moved Aderyn Glas through the French waterways to the Med. During six months of the 2009 summer they bimbled onwards to Corfu and Preveza in Greece starting in the south of France then over to Corsica followed by a circumnavigation of Sardinia, the northern coast of Sicily, and finally arrived in Greece in September of that year. 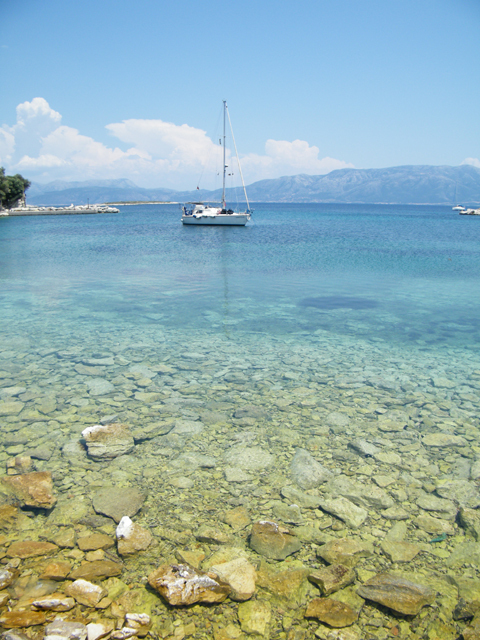 The summer of 2010 gave them a chance to relax after all that hard work and they soaked up the Greek atmosphere (and krasi) around the Ionian inland sea and will continue to do so until they get bored. If you want to know more then follow the link to their Sailing Blog.